Franklin Gebhardt was convicted this week of the brutal slaying of 23-year-old Timothy Coggins in 1983. On Oct. 9, 1983, 23-year-old Coggins was found stabbed to death near a rural road in Sunny Side, Ga. A newspaper article from 1983, published just after Coggins' body was found — and hadn't yet been identified — indicated that Coggins had struggled with his killers and that bloodstains and tire tracks were found near his body. Coggins' murder case was closed after only a few months of investigation, and for decades, his death remained unsolved. But last year, investigators surfaced new evidence via a slew of witnesses that led to the arrests of five people in connection with Coggins' death — including Gebhardt and his brother-in-law, William Moore Sr.
Moore is also a murder defendant in Coggins' case and will go on trial later this year. CNN reports that Moore, when intoxicated, told a witness that he "missed the good old days when you could kill a black man for no reason." 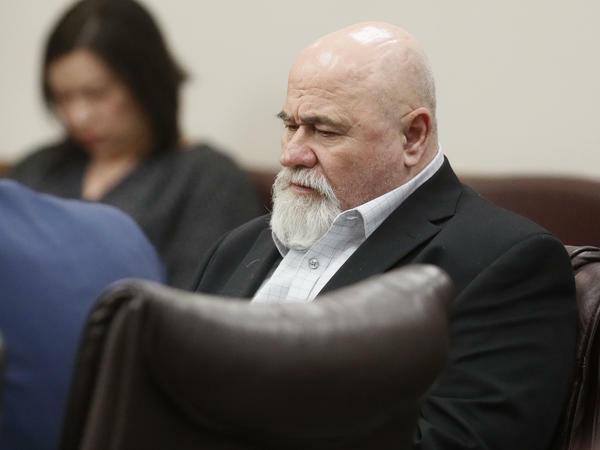 Investigators in the case argued that race — and Gebhardt's and Moore's own racism — were undeniably factors in the murder. Ben Coker, a Georgia district attorney, said Coggins was stabbed, tied to a truck and dragged through the woods. He was killed because he had been "socializing with a white female," Coker said. Witnesses told investigators that Gebhardt and Moore told them they killed Coggins because he had danced with a white woman at a club, reports CNN. Gebhardt and Moore "were proud of what they had done," Jared Coleman, a special agent with the Georgia Bureau of Investigations, said at an earlier pretrial hearing. Multiple witnesses testified that they had heard the two men boast about the murder. They "felt like they were protecting the white race from black people," Coleman said. When Gebhardt was questioned by law enforcement, the Atlanta-Journal Constitution reported, he said he "didn't like being around black people," at one point "hurling racial epithets and threatening a lawsuit." The Atlanta-Journal Constitution reports that the trial was complicated by the fact that "half of the evidence taken from the crime scene vanished over the years since 1983," which meant more reliance on witness testimony. The defense tried to discredit the witnesses — one of whom was a member of the Aryan Nations — calling them "opportunistic" informants. Despite those efforts, the jury ultimately convicted Gebhardt. After the verdict was announced, Heather Coggins, the niece of Timothy Coggins, addressed the court. "It was a brutal, heinous killing, and now we don't have to tell our kids and our grandkids anymore that 'No one cared for your Uncle Tim,' " she said. "Now we have someone who's guilty, who will spend the rest of his life in prison."